So I don't know about y'all but this winter has done a toll on my skin. I feel like as I get older it gets worse...or maybe I am just more aware of it (the joys of aging). I always love hearing what others use and love so I thought I would share my favorites with y'all. All of these products I currently use and love. No I don't necessarily use them all in one day but I adjust depending on what my skin needs are day to day on a few of them. The number one thing I have learned that makes the biggest difference with that awful dry winter skin....EXFOLIATE...I learned this from a Sephora worker a few weeks ago and it has been the biggest game changer. (plus the guy was in his 50s with skin that looked more 20s/30s...so I was all ears). Some of you probably already do this and I'm the one who's clueless! A little gross but you have to remove the dry, dead, flaky skin for your moisturizer to ever be absorbed by your skin....makes sense. FACE | I use the same face wash year round (I have sensitive skin so after finding one I love that leaves my face feeling clean, without any residue or feeling oily, plus doesn't cause a breakout...win! ), Boscia Purifying Cleansing Gel. I do however use a sensitive skin Buf Puf (yes like the one you used in middle school...they still make them!) to scrub instead of just my hands...works as a gentle daily exfoliator....and feel so good! A few times a week I then use the Boscia Exfoliating Peel Gel...this stuff is bananas...you just massage it on and your dry skin literally starts to ball up (gross...but at least you know its no longer on your face)! I also use this on my hands when they are looking rough and like an alligator. Finally I switch up between these two moisturizers...Kiehls Powerful Wrinkle Reducing Cream & Josie Maran Argan Oil. Some even use the argan oil on split ends and cuticles...but I love how soft it makes your skin feel. The wrinkle reducing cream I use more in the evenings because of its thickness. BODY | When I actually remember I try to dry brush before jumping in the shower...it helps with exfoliating and apparently helps detox your body (google it there are particular patterns you are suppose to brush in, ect...its a thing!). A few times a week while showering I use the Kiehls Soy Milk and Honey Body Polish...I love how you can feel the little gritty pieces! Then I always use Kiehls Creme de Corps as a body lotion...it moisturizes really well and doesn't irritate my skin! HANDS | My hands can be the worst this time of year...so many days I have to stop it the middle of working to do some sort of treatment on them. Kiehls Ultimate Strength Hand Salve is my favorite hand lotion...it really moisturizes and lasts longer than many other products I have tried. 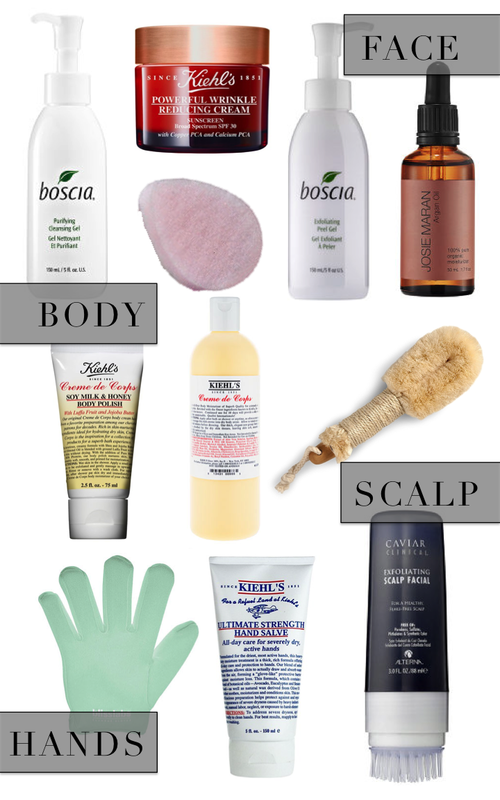 I also exfoliate using the above Boscia peel or Body Polish before applying lotion when they are super dry. I then sometimes immediately put on the gel lined gloves while watching tv or you could sleep in them if you want! SCALP | I HATE having a dry scalp...when you can't help but itch which is such a lovely sight for all around I'm sure. So I did some digging and started using this Alterna Exfoliating Scalp Facial...you just squeeze it in your hair and give yourself a little head massage with the built in brush...then wash as normal. Has made a huge difference! Would love to hear what some of your favorites are for beating dry winter skin? !